, son of the second Henry, was born in 1566, and educated with great care. After he had finished 1m studies, his father, who wished him to succeed to his own business, sent him on his travels that he might form connections with men of learning. He accordingly visited the principal cities of Germany, Holland, Leyden, | where he lived some time with Lipsius, and came also into England, where he is said to have formed an intimacy with John Castohus, a young man well versed in the ancient languages, but of whom we find no other mention. In 1599 he established a printing-office at Geneva, and produced some very correct editions of the Greek and Latin classics with notes, but not such beautiful specimens of typography as those of his father and grandfather. He died at Geneva in 1627, leaving two sons, Anthony and Joseph; the latter was king’s printer at Rochelle, and died in 1629. Of Anthony we shall take some notice presently. Paul published, 1. “Epigrammata Graecse anthoiogiae, Latinis versibus reddita,” Geneva, 1575, 8vo. 2. “Juvenilia,” ibid. 1595, 8vo, consisting of some small pieces he wrote in his youth. Among the editions of the classics which came from his press, there are few, if any, that used to be more valued than his “Euripides,” 1602, 4to. It occurs very rarely. We shall now briefly mention the remaining branches of this justly celebrated family. Henry Stephens, the third of that name, and son to Robert, the second, was treasurer of the royal palaces. Prosper March and thinks he was a printer in 1615, but no work is known to have issued from his press. 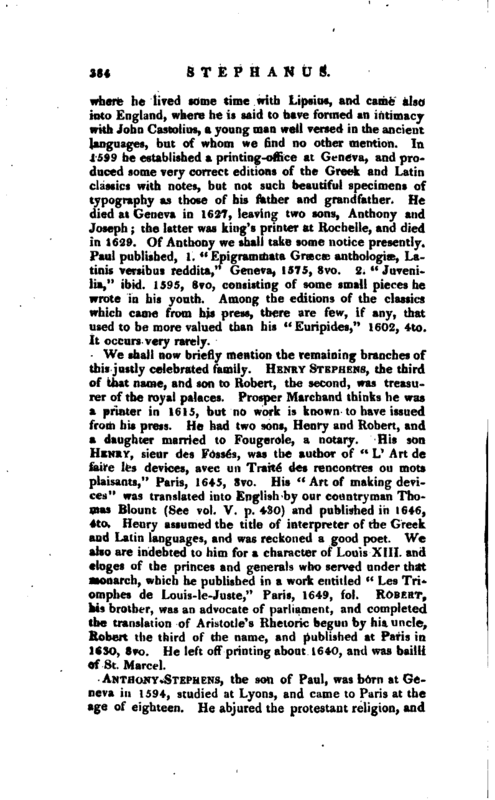 He had two sons, Henry and Robert, and a daughter married to Fougerole, a notary. His son Henry, sieur des Fossés, was the author of “L' Art de faire les devices, avec un Traité des rencontres ou mots plaisants,” Paris, 1645, 8vo. His “Art of making devices” was translated into English by our countryman Thomas Blount (See vol. 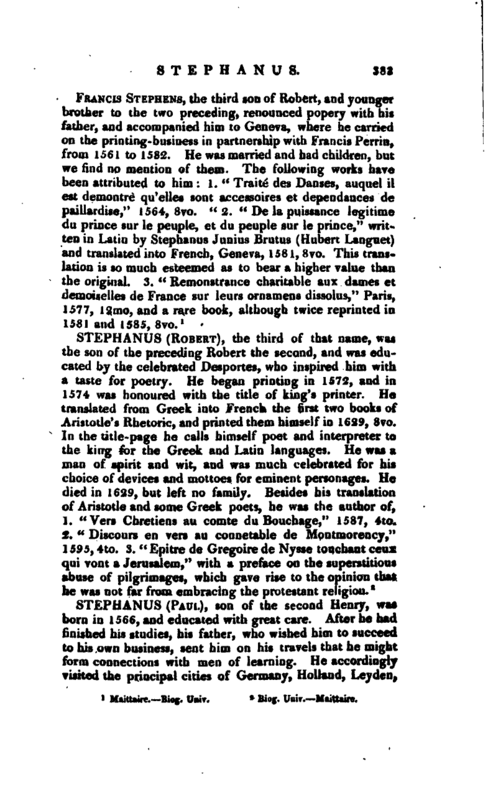 V. p. 430) and published in 1646, 4to. Henry assumed the title of interpreter of the Greek and Latin languages, and was reckoned a good poet. We also are indebted to him for a character of Louis XIII. and eloges of the princes and generals who served under that monarch, which he published in a work entitled “Les Triomphes de Louis-le-Juste,” Paris, 1649, fol. Robert, his brother, was an advocate of parliament, and completed the translation of Aristotle’s Rhetoric begun by his uncle, Robert the third of the name, and published at Paris in 1630, 8vo. He left off printing about 1640, and was bailli of St. Marcel.